Review by AllTheBestFights.com: 2016-04-16, good fight between Errol Spence Jr and Chris Algieri: it gets three stars. The undefeated Errol Spence Jr entered this fight with a perfect boxing record of 19-0-0 (16 KOs=84%) and he is ranked as the No.11 welterweight in the world. He fought four times last year beating Chris van Heerden (=Spence Jr vs van Heerden) and Alejandro Barrera in his last two (=Spence Jr vs Barrera). His opponent, the former Wbo light-Ww champion Chris Algieri, has an official record of 21-2-0 (8 knockouts) and he entered as the No.12 in the same weight class but he lost two out of his last three bouts, against Manny Pacquiao (=Pacquiao vs Algieri) and Amir Khan (=Khan vs Algieri); after this fight he won over Erick Bone (=Algieri vs Bone). 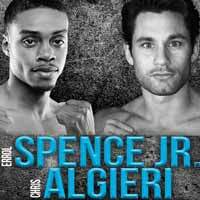 Spence vs Algieri is the main event of the evening. Watch the video and rate this fight!